Look around you, everyone is wearing a version of black, the skies are grey, and all the faces you see are frowning. Here, for those of us in the North anyway, there is only the hope of spring but now is the time to book a family trip to Amsterdam. In early spring, Amsterdam is in full bloom. The flower markets are filled with multi-colored tulips but if that is not enough color for you, see over 7 million flowers at Keukenhof gardens, just a short 30 minute bus ride away. The gardens are open annually from mid-March to mid-May. The best time to view the tulips is around mid-April, depending on the weather. From late March to the end of April, the gardens host numerous flower shows featuring not only tulips but hyacinths, freesia, daffodils. March 31st and April 1st children can meet the Easter Bunny. Later in the season, the city hosts the Amsterdam Open Garden Days, where 30 private canal gardens will be open to the public. There is nothing more I like than to peek into other people’s gardens. Each year these days are organized around a theme. This year the theme is coach houses and garden houses. This event will be held from June 14-16 and visitors can view the gardens each day from 10-5pm. After a year-long renovation the Rijkmuseum will re-open its doors in April. The museum is world renowned and houses some of the greatest Dutch masterpieces from such artists as Van Gogh, Rembrandt and Vermeer, among many others. This museum exemplifies tradition and change. Over the years it has been added to, renovated and restored. In 2003, it closed entirely for a complete renovation. Now the building is thoroughly modernized, while at the same time preserving its original design, and is ready to greet 21st-century visitors! The Van Gogh Museum has also been closed since last year and will re-open this spring on April 25th. This museum houses the largest collection of paintings by Vincent van Gogh in the world. A show marking the 160th anniversary of his birth will kick off the reopening. It is a not-to-be missed opportunity to see the artist’s methods and a chance to compare his paintings to works by other artists from the 19th century. The museum also has an extensive collection on various subjects from 19th century art history. The first thing you notice when you visit Amsterdam is the number of people on bicycles. Seriously, they are the minivan of the Netherlands. In fact, Holland has over 18, 000 miles of bike paths to enjoy. Bike rental companies abound in the city and can be found near main hubs such as Central Station, Leidseplein and Dam Square. Short-term rentals start from three hours and the average price for a full day is 8 euros. When in Rome: the Limburgs Mooiste bike tour through the rolling hills of Limburg (a lay person’s version of the prestigious Amstel Gold Race) is organized by the Grand Ballon Foundation. Held in mid-to late May, it is a great way to explore the southern region of Holland in a Dutch way. If you aren’t a cyclist, this event could convert you to their way of life. Although professional tour events must be registered in advance, people attending individually can park and camp in Avantis and sign up for the family events as they arrive. 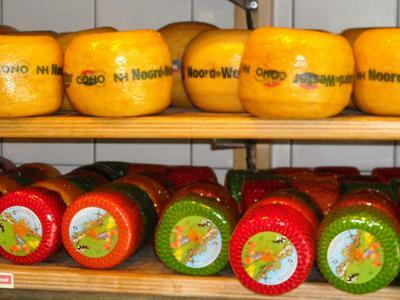 Cheese Museum – begin here first for an introduction to the most popular Dutch cheeses. Tromp – has a knowledgeable staff and offers a taste before you buy. Abraham Kef – has a selection of raw-milk Dutch cheeses, but is best known for its expertise in French cheeses. Reypenaer Tasting Room – for a professionally-guided tasting of their award-winning cheese. Easter: Amsterdam had family friendly Easter weekend festivities and you’ll find special brunches and dinners to suit every taste and budget. Artis Royal Zoo will offer brunch with quiche, scones and prosecco. Hard Rock Cafe has kids’ activities from 1 to 5pm including face painting. The Easter Sunday activities will be extra special. Pannenkoekenboot (Pancake Boat) will host brunch and Easter cruises including all-you-can-eat pancakes plus other festive treats. I mean it is a boat with pancakes, is there anything else to say? 5. Do you really need a fifth reason? OK, Amsterdam is historic and beautiful. It has classic architecture and picturesque canals. There is culture and art. The food is good and the beer is even better. In addition to her love of travel and books, History Buff Mom explores the history of NYC houses and their restoration in her blog, BrownstoneCyclone.com. A good article. I like the easter sunday family recommendations. I had forgotten those.